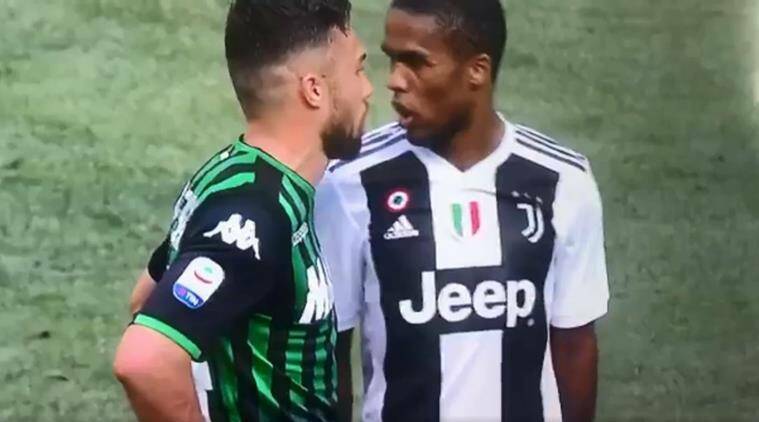 Douglas Costa received a red card for spitting at a Sassuolo player in Serie A match that the defending champions won 2-1. Douglas Costa put a dent on Cristiano Ronaldo’s celebration of opening his goalscoring account for Juventus when he received a red card for spitting at a Sassuolo player in Serie A match that the defending champions won 2-1. Costa escaped with a booking for elbowing and then head-butting Sassuolo midfielder Federico Di Francesco as they tangled before the late Sassuolo goal. The Brazilian, however, was shown a red card in stoppage time after video assistant referee caught him spitting at the same player in another altercation. It took the former Real Madrid forward Ronaldo nearly 320 minutes to score his first league goal for Juventus and he did it with the simplest of tap-ins. Ronaldo doubled his tally shortly after with a low cross that went past the Sassuolo keeper.